Game Over! The Tigray People’s Liberation Front which has ruled Ethiopia since 1991 has been ousted from power in Ethiopia, replaced by a new breed of leadership who have quickly moved to reassure the people that a real change is in the making. This past Wednesday, June 20, was a busy day for the new Prime Minister Abiy, an ethnic Oromo, Ethiopia’s largest nationality, traveling to the site of the latest ethnic massacre and addressing the leadership of the Gurage community calling on them to end the ethnic violence and bring peace to their land by dialogue and mediation. This was all broadcast live for all Ethiopians, both at home and abroad, to see via satellite television and warmly received by those to whom he directly spoke. Next door, here in Eritrea we sat glued to our tv’s late into the night watching Ethiopian television broadcast the address our President Issias Aferwerki had made early that morning during our annual Martyrs Day commemoration where he held out an olive branch of peace to our neighbors in Ethiopia, repeated over and over. The Ethiopian P.M. then went live and thanked the Eritrean President and promised a future of peace and prosperity in brotherly respect. And he did it in Tigrinya, the de facto national language of Eritrea. We could only pinch ourselves in disbelief, to have our long time enemies in Ethiopia suddenly change so positively, I mean EVERYTHING the Ethiopian P.M. has been saying could not be more true. The Ethiopian P.M. has gone on tv and described his governments past actions, and he acknowledges he was a part of this, as “terrorist” regarding its treatment of its political prisoners. He has addressed the T.P.L.F regimes past policy of divide and rule via instigation of ethnic bloodshed and spoke to what needs to be done to heal divisions and move forward. Here in Eritrea what we are hearing is music to our ears for the Ethiopian P.M. is saying just what our President Issias Aferwerki has been saying for two decades now, that we shouldn’t be fighting, instead uniting, to build a more humane and just society absent of foreign intervention. 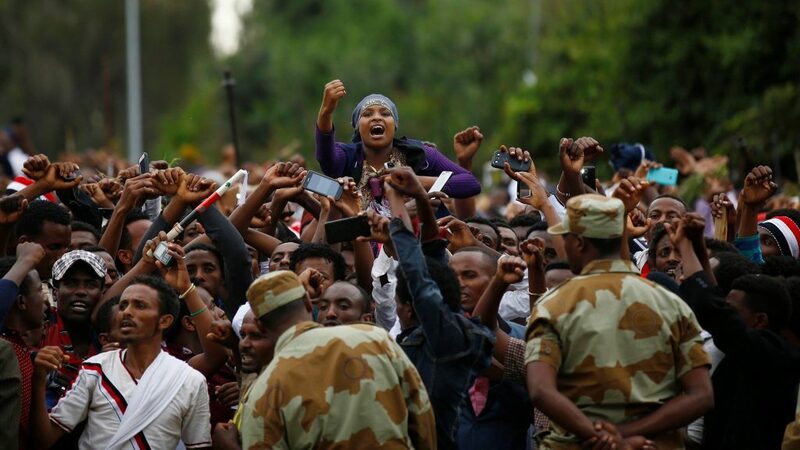 If this new Ethiopian leader manages to stay alive, there is hope for Ethiopia, that the nationalities, starting with the Oromo’s, the largest, who have been calling for independence, will reconsider their quest for separation and continue as one country. While one must respect the right to self determination reality is that the “Prison House of Nations” that has been Ethiopia up to now is best transformed into a modern, peoples democracy rather than torn asunder and left to fend for themselves as small, independent countries. This new P.M. could be the one to give them hope and allow a violent upheaval to be avoided. The Horn of Africa, the Horn of Hunger, the Horn of War and Famine may be seeing the birth of a new era, where Ethiopia no longer invades its neighbors at the behest of the USA. Where Ethiopians are able to leave behind their lives of hunger and thirst, of being cold, sick and illiterate and start to feed, clothe, house, medicate and educate its people, and turn a perpetual famine victim into a modern, prosperous land. For us here in Eritrea after 20 years of war followed by no war, no peace, we have hardened ourselves to not seeing a light at the end of the tunnel. This new leadership in Ethiopia is almost to much to believe, its almost like a dream to us still. Could we really live as brothers and sisters with our huge neighbor to our south? Just as with North Korea the Trump Regime has broken with decades of past policy towards the the Horn of Africa and allowed common sense and experience to hold sway. It may be just pragmatism, but those veteran diplomats in the US State Department know they have little choice in the matter, any further support for the TPLF regime would have been counterproductive and damage American credibility let alone result in the disintegration of Ethiopia, possibly followed by a South Sudan scenario. One thing is for sure, and Eritrean President Issias Aferworki said it with glee when he spoke at our Martyrs Day commemoration, “Game Over!” for the T.P.L.F regime, shocking all in attendance into spontaneous applause. What we have only dreamed about is now reality here in the Horn of Africa, and if the seasonal rains arrive this year and another drought is averted, then we can truly be blessed with “selam(peace) and rain for the Horn of Africa”. let’s wait and see what PM.Ahmed brings to Ethiopia’s people and its neighbors such as Eritrea,Djibouti , Somalia , Sudan and South Sudan if he can survive from Western and zionist hyper-warfare that long and we wish him all the best.